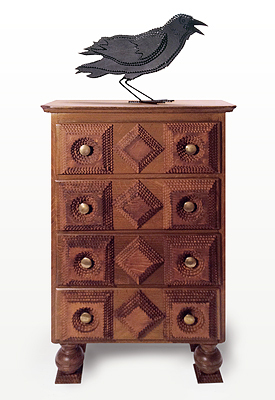 This piece is made from a vintage "Salesman's Sample" grain painted 4-drawer chest. The Raven's legs are brass rods wrapped with leather cording. Inside the drawers you will find eight Raven/Crow trade cards from the 1800's. The drawers are lined with the words to The Raven by Edgar Allen Poe.